K&K Devinity pickup & new frets :: 1939 Gibson L-7 [5.5 lbs] — Chubbuck Guitars :: making & repairing Guitars in a old building just north of Boston, Mass. 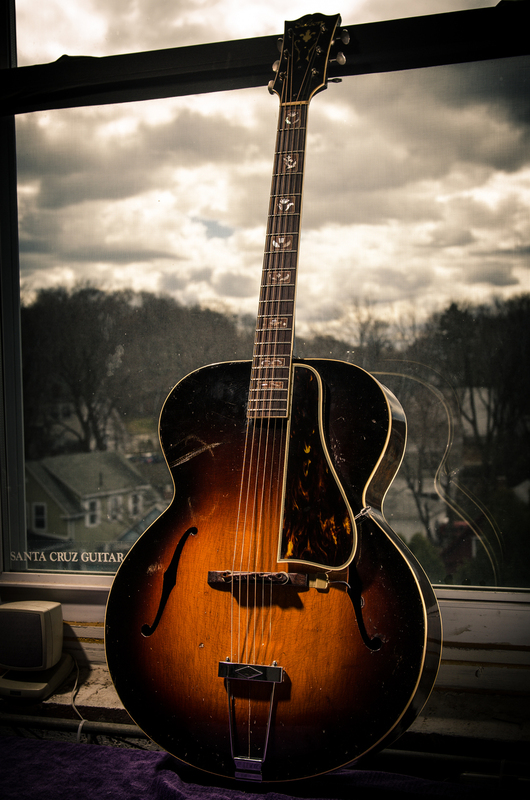 A big and beautiful 1939 L-7 archtop on the bench for a bunch of repairs. You can see some of the work done here. These repairs include new frets, new relic Waverly tuners, back binding repairs, side cracks and a K&K Devinity system pickup installation. I must say that I'm not normally impressed with acoustic pickups but this newer K&K pickup sounds very warm and transparent. I installed one of the older K&K archtop pickups in a 1940's Epiphone Emperor years ago and found it sounded very hollow and out of phase (even with correcting the phase with a preamp). Archtops can be difficult to amplify acoustically. After hearing this pickup I recommend that you give the K&K Devinity a try.